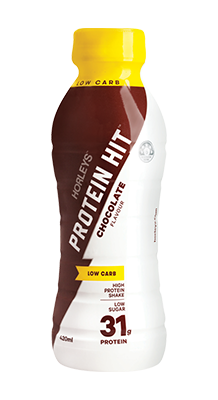 Horleys - Low Carb Protein Hit. Ready to go High Protein Shake. Ultra Low Sugar & Fat. Use Low Carb Protein Hit as a high satiety snack between meals, perfect for filling that gap when you're on the move. Combine with a source of natural fibre - like an apple -and you've got the perfect protein rich mini meal. If you're after a texture sensation, shake your Protein Hit Low Carb well and put the bottle in the freezer for an hour before drinking. McDonald's thickshakes, eat your heart out! For a complete recovery shake with quality carbs that's ready to go when you've finished your workout, try regular Protein Hit 420ml. Protein Hit comes in a PET bottle with a PET label sleeve and an HDPE cap. These are plastic codes 1 and 2, meaning this packaging is fully compatible with domestic recycling programmes in both NZ and Australia. Water, Protein Blend (milk protein concentrate, whole milk powder, calcium caseinate, whey protein concentrate), Polydextrose, Cocoa (1%), Stabilisers (460, 407), Flavour, Mineral Salt (339), Sweetener (955). Protein is essential to virtually every function your body performs to stay alive – and is also an important consideration in weight management and weight loss eating plans as well. Foods and snacks that contain protein have a higher satiety, keeping you fuller and more satisfied so you suffer less from cravings. Protein is also metabolically expensive – which means that your body uses more energy to process protein than other macronutrients – making a high protein drink the perfect snack when you’re watching your weight. High protein, low sugar, low fat shake for satiety and refreshment. BEST FOR: appetite management on a high protein low carb diet, high-satiety healthier snacking. High protein, low sugar, low fat - Low Carb Protein Hit delivers super lean body nutrition that fills you up (not out!). Saturated with a blend of quality whey and casein proteins, you get all the amino acids you need to help build a lean physique. Why struggle with a gloopy, oily alternative when you can have a refreshingly easy to drink protein shake made using quality New Zealand milk proteins with less than 10g of carbs per bottle? Super handy recloseable bottle format, perfect for those 'half now/half later' occasions, or filling that gap when you're on the go. Just like a chocolate milkshake only better! I can get protein from normal foods, why should I use a protein supplement? Normal dietary protein sources include meats like beef and chicken, fish, eggs, legumes, and dairy. However, while these sources are important in a healthy balanced diet, most of them come with unwanted extras like saturated fat and sugar. A protein supplement provides a quick and easy way to boost your protein intake, providing more of what you need and less of what you don’t. They are also more easily and quickly absorbed, which is ideal when you need to optimise the recovery window for muscle recovery. In addition, per-serve a protein powder can be a very cost-effective way to boost your intake. I can get protein from normal foods, why should I use Sculpt? Normal dietary protein sources include meats like beef and chicken, fish, eggs, legumes, and dairy. However, while these sources are important in a healthy balanced diet, most of them come with unwanted extras like saturated fat and sugar. Sculpt provides an easy way to boost your protein intake, providing more of what you need and less of what you don’t. You can tailor Sculpt to suit your own personal requirements – a quick lunch with a piece of fruit, the right nutrition for after exercise or a workout, a filling mid afternoon snack, a sustaining breakfast or something that will stave of hunger and cravings when you’re racing out the door.